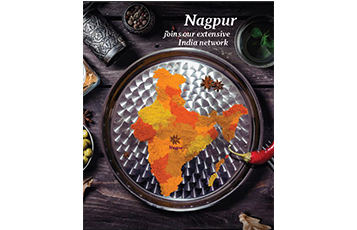 DOHA, Qatar, 2015-12-3 — /Travel PR News/ — Qatar Airways, the national carrier of the State of Qatar, now offers non-stop flights to Nagpur from Doha, effective today taking the airline’s total weekly passenger flights from 95 to 102 across 13 key cities in India. Nagpur is third largest city in the Indian state of Maharashtra and is a major trade and business center. The city has been identified as one of the flagship smart metropolises by the Government of India, with a special economic zone, multi-modal international cargo hub and a new airport in the pipeline. Qatar Airways will operate an A320 daily between Doha and Nagpur with an average flight time of just over four hours. The aircraft will feature 144 seats in a two-class configuration of 12 seats in Business Class and 132 seats in Economy. Qatar Airways connects 13 cities in India to an exciting choice of destinations via its hub in Doha including Chicago, Dallas, Houston, London, Miami, New York, Paris, Philadelphia, Barcelona, Rome, Washington D.C. and many more. Qatar Airways Cargo also has robust operations in India, currently offering its services to Ahmedabad, Bangalore, Chennai, New Delhi, Hyderabad, Kolkata and Mumbai with 27 freighter frequencies per week. In addition, Qatar Airways also carries cargo in the belly-hold space of all passenger aircraft. Qatar Airways has seen rapid growth in just 18 years of operation and today flies a modern fleet of 173 aircraft to 153 key business and leisure destinations across Europe, the Middle East, Africa, Asia Pacific, North America and South America. Since the beginning of the year, Qatar Airways has begun services to Amsterdam (The Netherlands), Zanzibar (Tanzania), Abha (Saudi Arabia), and Faisalabad, Sialkot and Multan in Pakistan. In the pipeline before the end of this year is Durban (South Africa). The airline’s network growth will be further boosted next year with the introduction of three new U.S. destinations, Los Angeles, Boston and Atlanta, two new Australian destinations, Sydney and Adelaide and also Birmingham in the U.K. This year, Qatar Airways launched Oryx One, an enhanced interface for its inflight entertainment system, increasing the number of movies and TV shows on board from 950 to up to 2,000. Passengers flying on Qatar Airways flights served by its B787, A350, A380, A319 and select A330 aircraft can also stay in touch with their friends and family around the world by using the five-star airline’s on-board Wifi and GSM service. This entry was posted in Airlines, Airports, Flights, Transportation, Travel, Travel Services, Travelers and tagged flights to India from Doha, non-stop flights to Nagpur, Qatar Airways. Bookmark the permalink.